In the English language, three titles within Commonwealth Realms refer to the same office of head of government: “first minister,” “premier,” and “prime minister.” One of my correspondents informed me of a fourth title found within the Commonwealth of Nations: the heads of government in the several Indian states go by “Chief Minister,” while the head of government of the Republic of India goes by the conventional “Prime Minister.” The same goes for the heads of government of the United Kingdom, New Zealand, and Canada and Australia at the federal level. The heads of government of the Canadian provinces and Australian states are referred to as “premiers”, probably in order to distinguish them from each country’s federal prime minister. The heads of the governments of the devolved jurisdictions within the United Kingdom – Scotland, Wales, and Northern Ireland – became “First Minister,” probably to differentiate them from the Prime Minister of the United Kingdom. (I often use “First Minister” as a convenient generic label that would cover both provincial and federal heads of government in Canada and Australia). Quebec’s political elites have long referred to the province, its institutions, its symbols and its collective goals in national terms. The provincial legislature is the National Assembly, its head of government the Prime Minister as opposed to a mere Premier […]. In the French language, the title premier ministre applies to all 10 premiers in Canada, not just to the premier of Quebec, because of a fundamental fact of the French language that has nothing to do with nationalist or secessionist politics in Quebec. The “Premier of Ontario” is le premier ministre de l’Ontario – and no one would suggest that this French-language title would amount to an aggrandizement of the office. 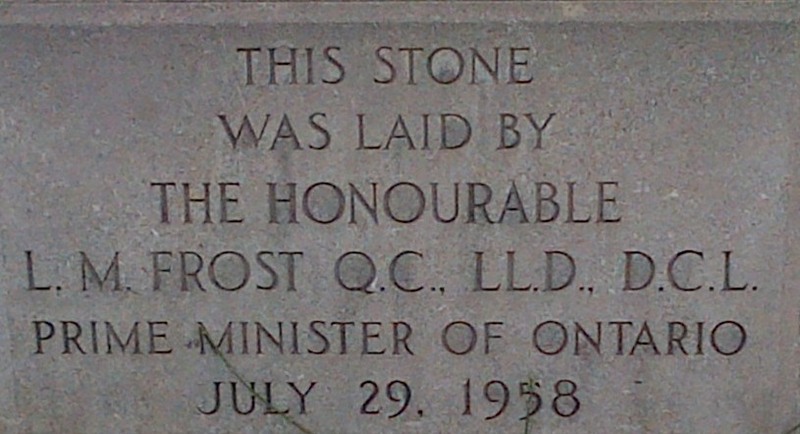 Leslie Frost, Prime Minister of Ontario, commemorates the Tory Building on 15 October 1957. 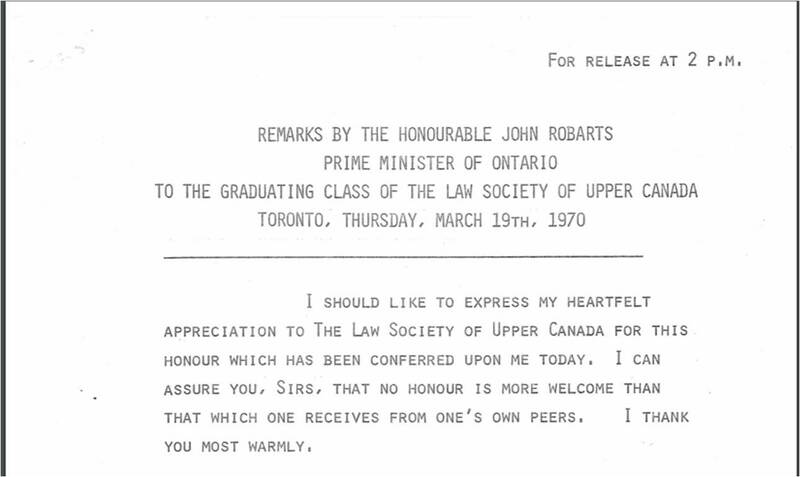 John Robarts also preferred the title “Prime Minister of Ontario,” as his address to the Law Society of Upper Canada in 1970 shows. But the last long-tenured premier of the post-war Progressive Conservative dynasty, Bill Davis, switched the title to “Premier of Ontario”, where it has remained since. Perhaps “Prime Minister of Ontario” sounds self-aggrandizing, but the first minister possesses the prerogative power to alter his own title. *Update: 2016-06-28: I thank Pierre Allard for having taken an interest in this old entry and for having informed me that it was Davis who changed the title. Sujit Choudhry, “Bills of Rights as Instruments of Nation-Building in Multinational States: The Canadian Charter and Quebec Nationalism”, University of Toronto Legal Studies Series, Research Paper 1006905 (August 2007): 1. Rand Dyck, Ontario Government and Politics. (Ottawa: Carleton University Graphic Services, 2009): 36. Rand Dyck, Ontario Government and Politics. (Ottawa: Carleton University Graphic Services, 2009): 37. Rand Dyck, Provincial Politics in Canada: Toward the Turn of the Century. 3rd Ed. (Scarborough, ON: Prentice-Hall of Canada, 1996), 327. This entry was posted in Crown (Powers and Office), Prime Minister's Powers and tagged Leslie Frost, Rand Dyck. Bookmark the permalink. The “provincial parliament”, on the other hand, seems to be a deliberate poke at CA 1867 s. 17, “There shall be One Parliament for Canada, consisting of the Queen, an Upper House styled the Senate, and the House of Commons” and s. 69, “There shall be a Legislature for Ontario consisting of the Lieutenant Governor and of One House, styled the Legislative Assembly of Ontario”. This was in the heyday of the provincialist Judicial Committee whose decisions contributed so much to an expanded sense of provincial autonomy and even perhaps of a status coequal with that of the dominion, so I suspect this change in language was part of the larger move away from the explicit provisions of the original Constitution Act. It’s always a possibility that Haldane’s sense that the provinces should be given the same status as the dominion in relation to the imperial centre motivated him to use the same term for both the dominion and provincial first ministers, but I would want to find more evidence before allowing myself the liberty of making that conclusion.